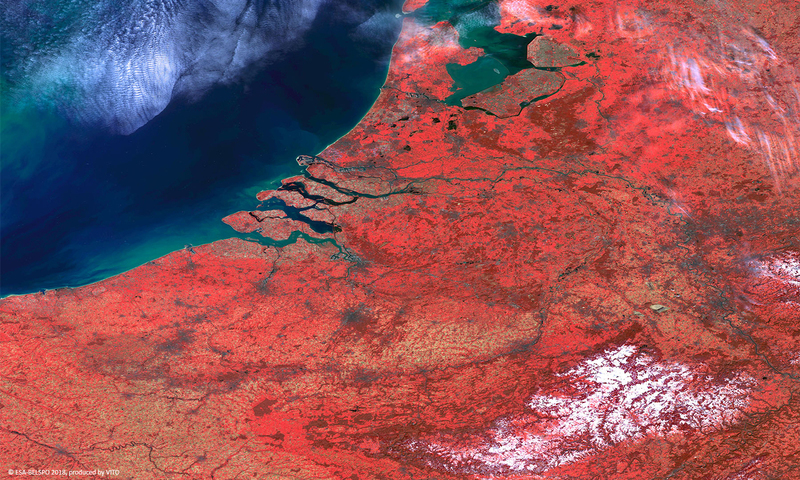 PROBA-V is consolidating its role as key data provider to the Copernicus Global Land Service and as valuable complement to the Sentinel-2 and Sentinel-3 sensors. From 29 – 31 May, the PROBA-V Symposium gathers scientists, students, end-users, and other stakeholders to present and discuss the latest scientific and operational results and applications. To highlight this event, we present a 100 m image of Belgium and parts of its neighbouring countries. Ostende is located at the coast near the Zeebrugge harbour in the middle-left part of the image. Further, several Belgian cities, such as Brussels, Antwerp, Liège, and Ghent can be located by the grey areas. And in the lower-right part you can recognize the snow-covered Belgian Ardennes.